The specific concerns that your smile faces depend on a variety of factors. For instance, the quality of your dental hygiene routine over the years, the presence of existing dental issues, and systemic conditions that are related to poor oral health can all become more prominent as time goes on. Fortunately, caring for your smile and addressing your risks of such issues isn’t necessarily more difficult. Even as you age, proper care and maintenance can help you maintain your healthy, natural smile and prevent dental health risks from becoming even bigger threats. Declining mobility is a common concern for older patients, especially those who deal with chronic conditions such as arthritis or serious injury. This can inhibit several important daily activities, including the ability to properly brush your teeth twice a day and floss at least once. Depending on the extent of immobility, many patients can benefit from battery-powered electric toothbrushes that do most of the manual work for them. Water flossers can also help when patients have difficulty gripping sections of floss tightly enough to clean between their teeth. Tooth loss can occur for a number of reasons, and even with assistive hygiene products, those risks may rise due to several different factors. For example, your gums may recede over time and become more susceptible to gum disease, the leading cause of adult tooth loss. Insufficient nutrition can lead to teeth that are structurally weaker, making them more likely to chip, crack, break, or be accidentally knocked out completely. Eating healthy, including taking supplements if your physician recommends them, can help ensure that your teeth and oral structures receive all of the essential nutrients they need to remain strong and healthy. When dental health concerns are left unattended over time, they can become a threat to much more than just your smile. For instance, if you exhibit gum disease, which involves excessive inflammation in your gums, then you can become more at-risk for other health conditions involving inflammation. That can include rheumatoid arthritis (which also affects your daily hygiene), cardiovascular disease, respiratory problems, and more. Treating any dental health concern as soon as possible is important at any age, but if you’ve neglected to until now, then waiting any longer will only increase your dental and overall health risks. 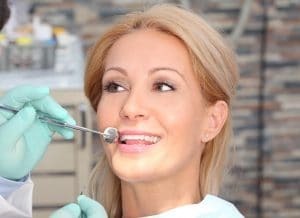 Much like the rest of your health, your smile may face several more serious concerns as you age, which makes keeping up with good hygiene and professional care all the more important. For more information, schedule a consultation by calling Syosset Dental in Syosset, NY today at 516-433-2211 or 516-921-6930.